The country’s embassy in the UK went one step further, accusing British journalists of vilifying Russia. The Russian embassy in London has accused British journalists of “launching a new phase of the anti-Russian campaign” in their coverage of the alleged poisoning of former Russian double agent Sergei Skripal. When asked for a response to Skripal’s alleged poisoning on Tuesday, the Russian embassy to the UK did not mince its words. A press officer for the embassy accused British journalists demonising Russia and called on UK authorities to share information on their investigation. “The situation regarding the hospitalisation of Sergey Skripal and another person on 4 March, as described by the British media, causes serious concern. “As of today, the police or other British authorities have not provided the Embassy with any official information regarding this incident. The Foreign Office has not given any notifications either. “However, the media are swiftly launching a new phase of the anti-Russian campaign ongoing in the UK. Readers are offered various speculations which ultimately lead to a vilification of Russia. “Although UK law enforcement agencies have not given any substantive comments on this incident, media reports create an impression of a planned operation by the Russian special services, which is completely untrue. “We believe that the British authorities and law enforcement bodies should step in immediately and inform the Embassy and the British society about the actual circumstances of this incident, so as to end the demonisation of Russia. 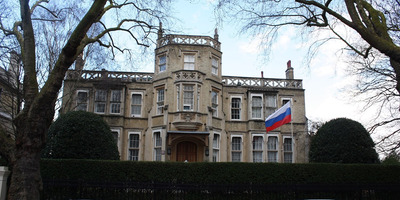 Krokodyl via Wikimedia CommonsThe Russian embassy in London. Earlier on Tuesday, Kremlin spokesman Dmitry Peskov called the incident “a tragic situation,” but denied knowing any information about the case, Reuters reported. He added that Russia would be ready to cooperate with the investigation if asked. The denial did little to stop Boris Johnson stoking the flames of speculation on Tuesday. The UK Foreign Secretary threatened to “respond appropriately and robustly” if evidence emerged of Russia’s involvement in the Skripal case. 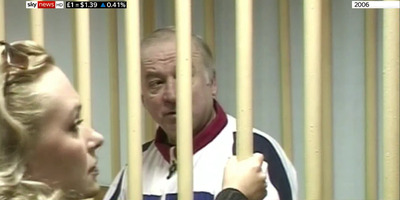 He confessed that he had been recruited by British intelligence in 1995, and passed the identities about Russian agents in Europe for around $US100,000 (£72,000).